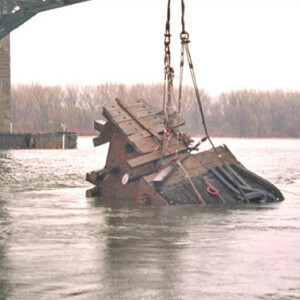 In 2003, heavy ice flows impacted and severely damaged the timber fender system at Tacony-Palmyra Bridge. Burlington County Bridge Commission contracted The Castle Group to determine damage extent and to remove debris. The inspection concluded the west nose of the fender system had totally separated from the rest of the fender, and was now lying along the channel bottom. Extensive analysis of the structure was done in order to develop the best methodology for removal procedures. Approximate configuration and weights of broken sections were used to determine the most economical and efficient equipment for the project. Due to large sizes of sections and the high marine traffic area, the broken section posed a potential danger to vessels. The Hydro-Marine dive team removed the damaged fender system by cutting it into smaller pieces able to be safely rigged and lifted with a crane. The debris was transported with a skow and disposed of at an approved site. Hydro-Marine provided the dive team, work boat, and underwater cutting materials enabling successful project completion.